Good day to everyone! I am so happy to tell you that I will be sharing some of my tried and true recipes with you. Christy asked me if I wanted to start writing on SouthernPlate.com on a regular basis and I immediately said “sure”. Then terror settled in! You see, I am from a different generation that is not really tech savvy. Christy assured me that she could walk me through it and I’d be fine. I’m still not real sure of myself so I hope that you will all hang in there with me while I learn the ropes. I promise I am a fast learner. I will be sharing some recipes that I learned from my paternal grandmother who lived next door to us. I spent a lot of time at her house growing up. Most of my memories take place in her kitchen. She raised ten kids, grew a huge garden, cooked everything from scratch and was an amazing cook. Once, Christy asked her readers who they would most want to share a meal with that had passed on. I knew right away it would be her, Mama Reed. None of her recipes were complicated. She cooked three huge meals a day and also had other chores so there was no time for complicated. Quick and delicious was what she went for. And I am here to tell you, she achieved that goal! She has been gone over 40 years and I can still taste her green beans and fried corn. I will also share new recipes that friends share at our get togethers. I have friends who are amazing cooks and we all share our recipes. They all have to pass the taste test with our husbands and grandkids. Now you will be included in our group. One thing I would like to ask of you is your input on recipes and ideas that you would like to see on Southern Plate. Sometimes I forget that foods I cook all the time may be a memory for you and you’d like me to share the recipes so you can make them for your family. I will be happy to help out whenever I can. 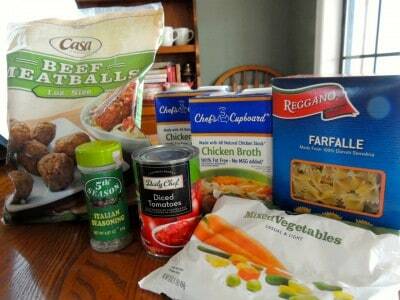 Today I’ll be sharing my recipe for meatball stew. Since it is made using frozen meatballs and vegetables, it is finished in no time flat. I make it for a quick lunch when my husband and I want more than a sandwich. It is especially good on cold winter days. If you made Christy’s Dr. Pepper Meatballs a few weeks ago, you may still have some frozen meatballs in your freezer – or you may have been like us and liked them so much that you had to make them again! Either way, I hope you enjoy this recipe! It is one of my favorite soups. This is today’s lineup of ingredients. Chicken broth, diced tomatoes, bowtie pasta, frozen meatballs, frozen mixed vegetables, and Italian seasoning. Combine broth, tomatoes, meatballs, vegetables, and Italian seasoning. Bring to a boil. Turn heat to medium and add pasta. I promise I took a picture of me adding the pasta but it must have been bashful because it immediately went under. Oh well, sometimes pasta is like that. Continue to cook for 12 minutes or until pasta is al dente and meatballs are heated through. 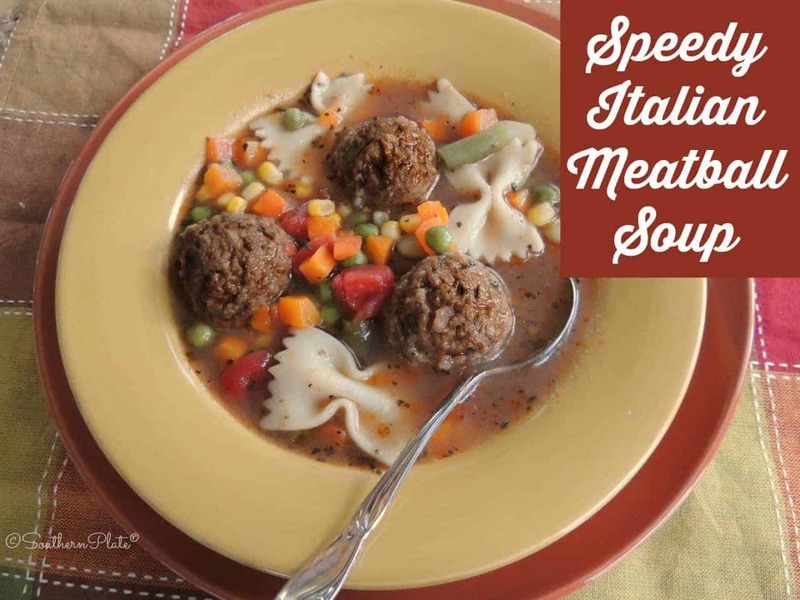 Combine chicken broth, tomatoes, vegetables, Italian seasoning, and meatballs. Bring just to a boil over medium high heat. Turn heat down to medium, add pasta. Continue cooking for approximately 12 minutes or until pasta is al dente and meatballs are heated through. I am so glad that everyone is excited! I have so many recipes to share that I can’t decide what to do next. Thanks for your comment! Welcome! Know we will all love your recipes and tales as much as we love and adore Christy. After all you raised you just right. I agree! Christy is a gem all right. She is so excited about everything! I hope you enjoy the recipes. Thanks for your comment. I was worried that I wouldn’t get any. I hope you are not disappointed. I have lots of stories and recipes to share. Welcome aboard, Mama! Glad we get to enjoy the ride together! Well, buckle your seat belt and hold on! We are just getting started. I am buckled up also and ready for more!! I am certain to enjoy all of your wit and wisdom as well as your recipes Mama Reed!! Thanks for starting this trip!! So glad that you decided to do this with christy. I am a big fan of soups and gumbos so this is definitely my ” bag”! The plus is how fast it goes together !! Most of my recipes have been simplified for today’s cooks. I know how busy everyone is even if you are a stay at home mom, like me. I have three grandsons living here for awhile. They are most concerned with fast and plenty as far as food goes. I love soups and stews. As soon as it gets cool I start making huge pots of soup. We always have cornbread with it since my hubby thinks they go together and soup isn’t soup unless you have cornbread with it! Welcome! I am so happy that you are joining with Christy. Like you, I have raised my children and now enjoy my gradnchildren. I am looking forward to your stories and receipes. May God continue to bless you and yours. When I found Christy’s site after purchasing one of her books, I was very impressed with her Christian values and her willing heart to share. …welcome, Christy’s momma! I have been enjoying Christy’s recipes since my daughter introduced me to her website a 2 or 3 years ago and have been hooked ever since! My maternal grandmother’s old handwritten recipe journal has been ‘lost’ in the family for years so we no longer have that treasure trove, but through my aunt’s on my paternal grandmother’s side, we have some of those that I have begged and now use. I also enjoy sharing and swapping from friends, family and strangers! I am shamless, my husband says, when it comes to asking for this recipe or hint from someone, lol! You are very welcome and I am looking forward to your recipes. Sweet potato dumplings have me looking forward to the recipe for them. Thanks! It is great that you have agreed to conquer your fears and jump right in to the blogging world. Your recipe sounds great and I am looking forward to more. From someone who grew up cooking with my maternal grandma and my mom who were both amazing cooks, I treasure the old recipes. It always amazes me when I bring one of my families recipes to a potluck and people ask for the recipe because they “have never had anything like it before.” More often then not, the recipe was one that was regularly in our families rotation. My grandmother used to make fried red cabbage that has apples, a little bit of onion, some sugar and something else. The problem is that none of my family can remember what the something else is! If you have any suggestions, I would love to hear them. God Bless You and Your Daughter! Could it be caraway seed? I know that is what goes into the stuff in a good german restaurant. It’s an aquired taste so be careful how much you use. To tell you the truth I’ve never used caraway seed. If you like the taste of it, then I’d say go for it and let us know how it turns out! Hi Carla, Did you see the comment that suggested the other ingredient is probably cider vinegar. Seems right to me. Try it and let us know. I make a similar soup, and wanted to suggest that it works well in the crock pot too! So nice to come home to warm soup and serve it with crusty bread on a cool Fall or cold Winter day. I recommend using fewer noodles or adding more broth for the crock pot, since the noodles will absorb lots of liquid during a longer cooking time. Or, I sometimes substitute cubed raw potato for the noodles. Welcome! I try new recipes weekly and love quick easy dinner ideas or things I can prep on the weekend or a day or two ahead such as a sauce for wings or pasta, etc. I try to do ahead so the long work days aren’t as hard when I get home. Hi Janice! I’m so glad you are going to be sharing some of your recipes! I love the recipes that Christy shares and have printed MANY and tried some! I haven’t been disappointed in any of them. I’m looking forward to the recipes from Mama Reed. Some of the old recipes are the best! Looking forward to trying and enjoying some of your recipes, Janice. 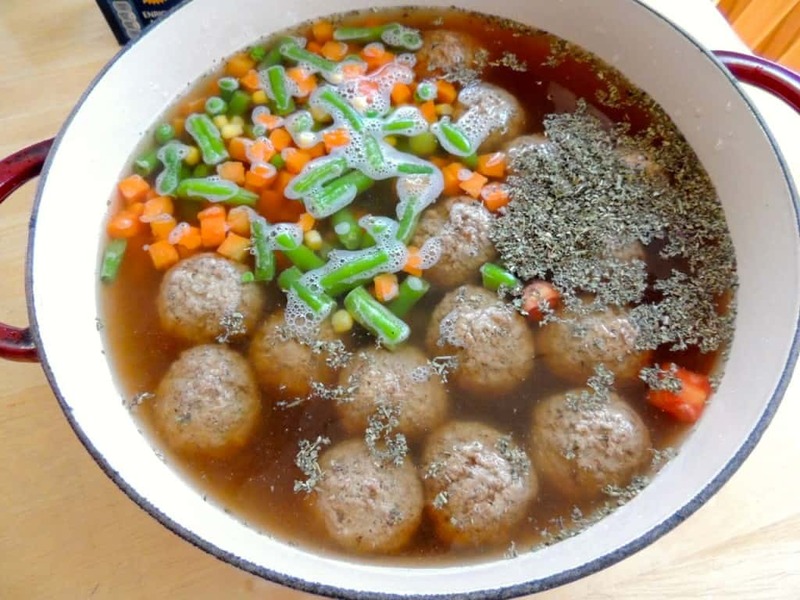 The meatball soup looks great and I love simple recipes with what I call “normal” ingredients. Welcome. Welcome!! I like the idea that good from scratch (sort of) does not have to involve cooking the whole day or even for several days before you put the whole dish together. Funny I have a kitchen full of gadgets and my Grand Mother and Mother had some nice cast iron a stove, and some sharp knives and they cooked circles around anything I do. Welcome aboard Mama 🙂 thank you Christy for sharing the spot light with your mother, you could not have picked a better person….and I know you will agree with me here…..
I’m so glad to see that you took up Christy’s suggestion. I’m looking forward to seeing ‘your stuff’ Christy is fantastic and no doubt that a huge part of that is because of you. I plan to try your meatball stew this weekend. Thank you and happy posting! You? Worried that you wouldn’t get any comments? Are you kidd’in? You go MAMA Janice!! I really enjoy Christy’s stories about you, reminds me of home! She is such a wonderful person, you should be proud. What a wonderful family!! I’m so glad that you decided to do this with Christy. Looking forward to trying your recipes. Welcome aboard! Hi Mama and welcome! Thanks for the great recipe. Reminds me a lot of my Nanny’s vegetable soup, made with ground beef instead of meatballs. Your grandmother and my Nanny were of the same stock, she cooked the same way, had a garden, and lived next door to us too!! My Nanny has been gone 25 years now, but I do have some of her hand written recipes to remember her. Looking forward to more recipes from you, and memories! Thanks, Mama! Glad you hopped on board! This will be an exciting journey because you will have Christy right there with you. 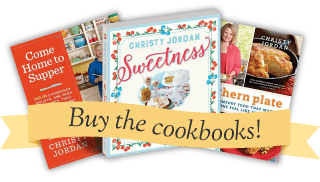 I love Christy’s recipes that were passed down and the stories that come with them. I can’t wait for your recipes and stories, it just makes me think back to the “Good Ole Days”. Thanks Mama! We love y’all to pieces! I really appreciate and rely on your family’s recipes. Love this, easy and quick. Looking forward to more. Welcome! I am looking forward to seeing your recipes — I so wish that I had paid more attention to my mama’s cooking while she was living. You and me both Redawna!! But I’m sure looking forward to learning some great recipes from Mama Janice! Welcome and we can’t wait to read your thoughts and try your recipes! Thank you. What a wonderful idea. I will enjoy reading your posts and recipes. Hi Mama and welcome! Christy had to learn all those great recipes and get her kind, loving and generous heart from SOMEwhere…and I think I can guess that you and her grandmothers all played a BIG part in that, so thank you for sharing her with all of us! It’s easy to see where Christy gets her sense of humor and her writing abilities! I bet it’s a hoot when you two are together. Thanks for this recipe and others to come. My husband LOVES soup so I’m always looking for something new. Have to admit though, it’s makes me curious as to what Christy is up to – must be a new “project” on the way. Hope it’s something great for her and I look forward to finding Southern Plate in my inbox! Christy and I have a really fun time when we are together. We laugh and joke so much! Sometimes even the smallest thing gets us tickled. Christy always has a new project in the works. Sometimes it is just in her mind, other times on paper. We will just have to wait and see what this one is. Thanks for your comment. Hey Janice! I love this recipe – I’ve had it in my “favorites” file for awhile. I assumed I must have gotten it from Christy since many of my favorites are from her. Looking forward to more of your recipes! Try it soon and let me know what you think. Glad to have you on board, Mama Janice. This soup looks delicious, can’t wait to try it! My husband has planted Turnip greens mixed with Mustard Greens. I fix the greens all the time, but never the turnips. Would like to know how to fix a no frills turnip dish. Is that the same thing as Rutabaga Turnips, or is that something entirely different. My Mama use to fix turnips and they were so good! Looking forward to many of your wonderful recipes! I think that rutabaga turnips is different but similar in taste. I like the greens but not the turnips. I’ll check with some of my friends to see if they have any good recipes and pass them along. I love turnips as well as the greens. Sometimes when I fry up ham, I add cubed turnips in place of white potatoes. The ham infuses them with good flavor. You can also boil the turnips and make them like mashed potatoes. Give them a try. They are not starchy like potatoes so have less carbs in them. Enjoy! Thanks Joyce!! I am going to try the cubed Turnips & ham. That sounds really good! My Mama cubed hers up too. This may be what she did. Hope so. Precious Mama…Thank you for “going for it” and joining Christy on the journey of good, simple, sensible, tried and true recipes. Each time that I need a special meal, I always go to Southern Plate or her cookbook. I enjoy the recipes that you have posted previously and know that you have a treasure trove of others waiting for us. You have certainly raised a wonderful daughter and I ask God that He Blesses her family and yours daily. I will be anxiously awaiting your next recipe and your wit and wisdom. One other thing I wanted to ask. Could I use Italian Dressing in a bottle. I have that, but not the seasoning packet. If so, how much would I need. Thanks!! I don’t think the salad dressing would be the same but it would probably be really good. If you decide to try it, let me know how it turns out. Peg…Just my 2cents on this…Italian seasonings is mostly thyme and oregano so if you have both of those use them instead of the salad dressing….Could even add alittle garlic, would be good…Make it your own..sure it will be wonderful! Hey Martha, thanks for the information. I’ll try that. Janice, I love that you’ve decided to do something that scares you a little! You will be blessed by doing this, and so many others will be, too. Think of it as a wonderful way to minister – your own special gift – to others that will feed their spirits while warming and satisfying their tummies. This cooler season is the perfect time to start! Thanks so much for the incouragment!